Southside Ann Arbor, Michigan Real Estate and Community Info. South of downtown between Ypsilanti and Pittsfield, the Southside Ann Arbor community has gained a reputation among residents as a business corridor. There are many residential communities in the area making Southside Ann Arbor a convenient place to live and work. Southside Ann Arbor is close enough to downtown for its residents to easily enjoy the culture and vigor of a college town, without the noise and clamor of the collegiate sector. Whether it’s the excellent schools, business friendly infrastructure, shopping or home values, you’ll find something to love about living in Southside Ann Arbor. If you need it, you can find it minutes from Southside Ann Arbor. Southside houses a wide variety of retailers and services, including both local and national chain stores. The Briarwood Mall across the street from Zingerman’s Coffee, houses over a hundred different shops and snack stops. Nearby you’ll find many other shopping centers like the Colonade Shopping Center, Concord Center Shops or Waters Place Shopping Center. Eateries in Southside offer a comfortable, relaxing experience. Great flavors and great values: the perfect answer for a celebration or a long day at the office. Why not order a juicy burger on challah and an ice cold beer at the Jolly Pumpkin Café and Brewery? When you dine in Southside Ann Arbor, you can count on consistency and familiar favorites. For those who prefer to cook at home, Zingerman’s Bakehouse puts on a “BAKE-cation”: a four-day baking class that teaches pastry and artisan bread making basics. Students go home with a basket full of fresh bread and the ability to bake more in their own kitchen. In the Ann Arbor Metropolitan area there are hundreds of scenic places to sit down for lunch as well as groomed parks for throwing Frisbees, tee ball, or whatever. There are a number of off-leash dog parks located throughout the city. Kids can sign up with the local Ann Arbor Parks and Recreation department for summer camps, swimming lessons or sports camps. Notably, Buhr Park, on Packard Road, includes 39 acres of grassy hills, picnic areas with primitive grills, an ice arena and an awesome swimming pool that caters to swimmers of all ages and abilities. When the weather warms, rent a canoe or kayak from one of the canoe liveries and hit the Huron River for a cool day trip. Because Ann Arbor is home to a school from the Big Ten Conference, football season is probably the most exciting time of the year in Ann Arbor with maize and blue clad fans everywhere. Even though Southside Ann Arbor emphasizes business, you won’t find a better selection of places to play en route to your home or office. Because of its proximity to the university district, area parks and shopping centers, residents enjoy living in Southside Ann Arbor. Recently, area businesses combined forces to create the Southside Business Association (SSBA). Since its formation, SSBA has endeavored to promote networking, visibility and the retail atmosphere of Southside Ann Arbor. As a result, the Southside area has positioned itself to become a more prominent business sector through cross-promotion and area events. The Southside Ann Arbor community is served by schools from the Ann Arbor and Saline School Districts. Nearby, students gather from all corners of the world to study at the renowned University of Michigan. The UM boasts top programs in almost every department and has about 41,000 students. In addition to the University of Michigan, there are a number of other secondary schools minutes from Pittsfield such as Washtenaw Community College, Cleary University and Concordia University Ann Arbor. 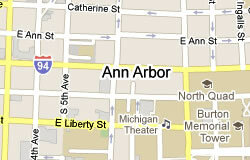 Getting around in Southside Ann Arbor is convenient as US 94 surrounds the southern end of the community. Or, leave the car at home and take the bus: ‘The Ride’, Ann Arbor’s bus system, offers residents a cheap, eco-friendly commuting alternative. The Ann Arbor Airport is located at the intersection of State and Ellsworth Roads, just south of Interstate 94, but many people choose Detroit Metro airport – about 25 miles away – for air travel. Southside Ann Arbor is within easy reach of two hospitals, St. Joseph Mercy Hospital in Saline and the University of Michigan Health System.